Shuichiro Yoshida Architects designed a toilet space in Chikusei, Japan. Here is the press release by the architect office. The project is located in Chikusei City in Ibaraki Prefecture, approximately 60km north-east from Tokyo in Japan. In this region, there are historical storage buildings of stone since early 20th century, although the most of these buildings, called “Ishi-Kura” in Japanese, were demolished and disappeared from the townscape due to the city development after the World War II. A volunteer group in the region obtained one of the storage buildings and maintains it as their activity base for discovering the region-specific historical and cultural heritages. The building is named as Tokinokura, which means a storage persists in past and future. Although Tokinokura is in good condition and useful for the volunteer group, there was no lavatories for the visitors and staffs. In autumn 2008, the group organized a public design competition for the lavatories, which they desired for long time. This design was selected out of 76 applied design proposals and constructed in Feburary – May 2009. This small lavatories building includes two booths for men and women. Although the floor area is only 8.62㎡, there is rich space above the booths. It is intended that the lavatories starts new history with Tokinokura. It means not only to preserve the region-specific landscape but also to create new landscape in future. 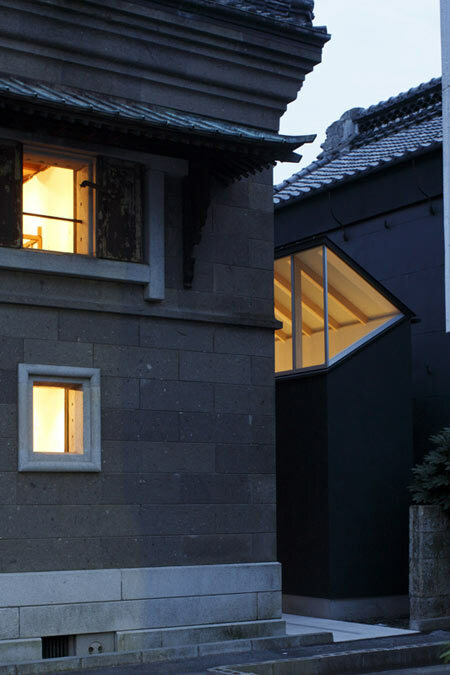 Visitors in the lavatory booth could experience quiet and rich feeling, enjoying the soft light from the upper window and the framed view of the old stone wall of Tokinokura. Interior Wall finish: White plasterer finish of Japanese traditional material called “Shikkui” which has humid conditioning and fire prevention. Many traditional, important architecture as Temple, Shrine, Castle in Japan finished this material on their walls. Exterior wall finish: Black and elastic plasterer finish coordinating with the surrounding landscape. Approach floor finish: White granite stone like the back wall material of Tokinokura. Roof and window frame: Barium steel gull with black printing painted like the materials of covered wall in neighbor storage.